The Zurich Instruments HDAWG multi-channel Arbitrary Waveform Generator (AWG) has the highest channel density available in its class and is designed for advanced signal generation up to 750 MHz bandwidth. The HDAWG comes with either 4 or 8 DC-coupled, single-ended analog output channels with 16 bit vertical resolution. Output switching is supported between a direct mode, with maximized bandwidth and superior noise performance, and an amplified mode, that boosts the signal amplitude to a maximum of 5 Vpp. With 2 markers per channel precise setup synchronization is guaranteed while the full 16 bit output resolution is maintained. LabOne® provides a state-of-the-art programming concept that combines the performance and flexibility of an AWG with the ease-of-use of a function generator. The platform-independent LabOne User Interface (UI) and a choice of APIs for LabVIEW®, .NET, MATLAB®, C, and Python enable easy measurement automation and fast integration into an existing control environment. The HDAWG is a high-end instrument designed to meet the requirements of demanding applications by extending the core AWG functionality with additional waveform memory, function generator functionality, internal oscillators, real-time precompensation, and a set of pulse counters. Multiple HDAWG instruments can be automatically synchronized and controlled using a single user interface, enabling efficient scaling of radar and quantum computing systems while reducing complexity and lab space required. The short 50 ns reaction time to an external trigger signal enables quantum error correction methods with high fidelity. The internal oscillators minimize waveform upload times, ensure phase coherence and provide a simpler waveform definition. The integrated pulse counter helps simplify setups for trapped ion and N-V center experiments. Signals in NMR and other spectroscopy applications occur at timescales from nanoseconds up to seconds. The HDAWG can speed up these measurements by applying a variable sampling rate and/or parametric sweeping. Using digital modulation, an arbitrary envelope can be imposed on one or multiple carrier signals with minimal waveform upload time while phase-coherence is maintained without additional effort. Nested sequencing, waveform iteration, and dynamic sequencing with DIO control are ideal for realizing signals for extensive high-throughput testing. Multiplying or adding the AWG signal with a function generator signal extends the possibilities and helps simplify and speed up daily measurement routines. Yes, there are two configurations: a 4-channel and an 8-channel model (HDAWG4 and HDAWG8). The HDAWG4 cannot be upgraded to an HDAWG8 and the upgrade options for the two models are not compatible, i.e. you cannot install the HDAWG4-FG Function Generator option on the HDAWG8 and vice versa. Do I need a computer to operate the HDAWG? Yes, this instrument is operated from a computer connected via USB 3.0 or 1GbE. The computer uploads waveform and sequence data to the AWG. Once the AWG is started, it generates its signal autonomously and doesn't strictly depend on the computer anymore. How can I install and update the control software? The LabOne software is freely available on our download center with updates appearing on a regular basis. The LabOne software provides a single-click utility to update the instrument firmware as well. Where can I get a live demonstration of the HDAWG Arbitrary Waveform Generator? Just call us on +41 44 515 0410 or send a quick note with your contact details and preferred time slot. We're happy to schedule an online demo to discuss your requirements and check if there is a match with the HDAWG instrument capabilities. How many markers does HDAWG have? How can I access them? The HDAWG has two markers per channel (8/16 in total). One of the two markers per channel is on the front panel (SMA), and one is on the back panel (32-bit DIO). Using any of the markers does not reduce the 16 bit resolution of the output. The HDAWG8 is the 8-channel variant of the HDAWG Arbitrary Waveform Generator. In terms of frequency range, vertical resolution, and other signal generation specifications, this instrument is identical to the HDAWG4 4-channel variant. The 4-channel variant cannot be upgraded to an 8-channel variant. The HDAWG4 is the 4-channel model of the HDAWG Arbitrary Waveform Generator series. In terms of frequency range, vertical resolution, and other signal generation specifications, this instrument is identical to the HDAWG8 8-channel model. The 4-channel model cannot be upgraded to an 8-channel model. The LabOne UI is designed to get you going quickly by providing hardware control in an intuitive and easily readable form. After defining the waveforms and sequences in the LabOne AWG Sequencer, the LabOne AWG Compiler translates the instructions into machine language and transfers the result to the hardware in a minimum amount of time. LabOne sequencing supports loops with dynamically varying delay and conditional branching points. In addition to the standard waveforms, e.g. Gaussian, Blackman, sinc, etc., LabOne contains all the essential math and array editing tools required for complex waveform design. You can easily add, multiply, cut, and concatenate waveforms or organize them in segments. Importing measured signals or waveforms calculated in another tool like MATLAB is a simple drag-and-drop action. When multiple instruments are used, the LabOne AWG Compiler takes care of distributing your master sequence program across all instruments. An automated trigger exchange protocol ensures synchronized playback timing. Using MDS you can also build up a complete signal generation and acquisition system, including UHF instruments, comprising lock-in amplifier, boxcar, digitizer and AWG functionality up to 600 MHz. 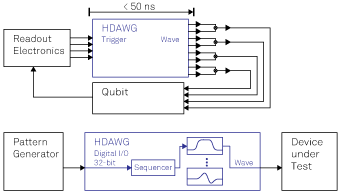 The HDAWG is equipped with digital oscillators to generate the sinusoidal carrier of a signal independently of the programed AWG envelope signal. This means that long signals can be generated with very fast waveform upload and precise phase coherence across many pulses. Carrier frequencies and phases that would otherwise be written to a static waveform can be freely adjusted and swept. The HDAWG-MF Multi-frequency option increases the number of oscillators and enables full digital I/Q modulation for frequency and phase modulation, frequency multiplexing, or phase cycling. With the HDAWG-FG Function Generator option, the modulation concept extends beyond sinusoid carriers to general carrier waveforms. Thanks to the low-latency design, the HDAWG is able to generate its first sample on the signal output less than 50 ns after detecting an external trigger on one of the trigger inputs on the front panel. This is essential for feedback experiments in quantum computing where device properties are short-lived, and each nanosecond saved improves the experimental outcome tremendously. The 4 or 8 output channels of the instrument can be grouped in units of 2 or 4. Each of these groups can then be individually triggered which increases flexibility when distributing signals to separate parts of a device or setup. 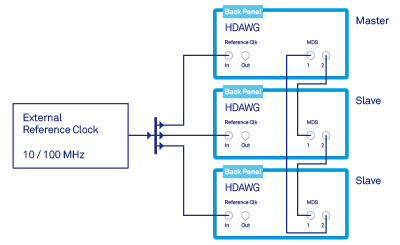 In order to generate signals with a high complexity and real-time control, the HDAWG is able to select from up to 1024 pre-stored waveforms in a programmable memory based on the bit-pattern applied to its 32-bit digital input. These could represent a digital modulation pattern, a device-specific test waveform, or a multi-qubit state readout result. The HDAWG-CNT Pulse Counter allows the analysis of up to 8 pulse trains in parallel, enabling event-based measurements, e.g. photon detection using photo-multiplier tubes, at a maximum count rate of 300 MHz. There are four distinct modes of operation and each channel offers an adjustable discriminator with a range of ±10 V. Measurement results from the pulse counters can be conveniently analyzed with the LabOne toolset, which features time domain and histogram display. 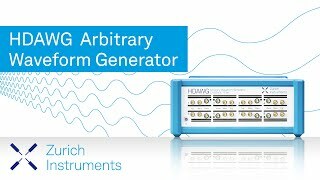 The HDAWG-FG Function Generator option simplifies and speeds up the generation of periodic signals on the HDAWG Arbitrary Waveform Generator. Flexible control of the signal frequency, amplitude, duty cycle, and waveform is enabled by direct digital synthesis (DDS) technology, while a dedicated tab in the LabOne UI eliminates the need for programming to obtain periodic waveforms. The HDAWG-ME Memory Extension option increases the available waveform memory of the HDAWG Arbitrary Waveform Generator from 64 MSa per channel to 500 MSa per channel. This improves its capabilities for handling large libraries of waveforms for high-throughput device testing as well as for generation of wide-band chirp or noise signals. HDAWG-PC Real-time Precompensation ensures that the signal at the device under test matches the one designed on the HDAWG Arbitrary Waveform Generator. Through the principle of inverse filtering, this feature minimizes the effect of imperfections in the signal path. At its heart is a widely configurable digital filter applied in real time before the generated waveform is converted into an analog signal. PC CPU requirements Compatibility with SSE2 instruction set required.